1. Read all international student information about the school: Every institution will have some information available on their website about life as an international student. If you have paid fees to attend, you will also be entitled to a variety of orientation package information via mail or at your orientation. Also familiarise yourself with all the available resource centers on campus. 2. 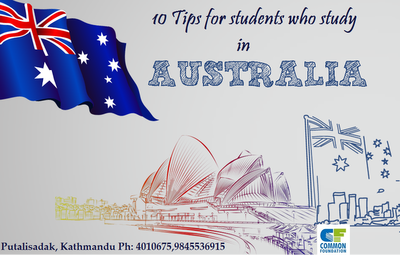 Be aware of your rights and responsibilities in choosing your accommodation, especially when off-campus: There are many different types of accommodation options for students in Australia. These include boarding, home stay, house sitting, sharing, renting, living with family or friends, buying etc. Most schools, colleges and universities have “housing services” departments that can provide information and assistance. Read through the rights and responsibilities booklet before you sign agreements. 3. Make sure you receive and provide important information in writing: Verbal agreement or communication is always difficult to prove. You need to keep copies of all your communication in writing, especially in terms of shared accommodation or expenses. 4. Find a variety of new friends inside and outside of school: This is particularly important for students at a new school. It might be preferable to find friends of diverse backgrounds; it helps you to blend in and understand the new culture. Australia is a very multicultural society. 5. Expect it to be challenging: Life in Australia, like any country or location, can offer wonderful opportunities and difficult challenges. We have found that the most successful “newcomers” are those that expect it to be challenging. They realise that there may be times when they have to ask for help, seek advice and rely on other people. 6. Ask questions and ask for help if you need it: It is perfectly normal to ask questions in Australia. It is not a sign of weakness. You are not expected to know everything, but you do need to have the skills to find information. Seek professional help in the form of counselling at your school if need be. 7. Collect some local tourist and community information so you know about other services and have other things to do besides studying: It is a good idea to visit your local council and collect a “New Resident’s Kit” or a “Community Information Booklet.” These will give you a lot of information about where you are living. 8. Get to know all your modes of transportation for mobility’s sake: Transport is important. You need to know different ways of reaching your school, such as bus, train, taxi, bicycle. Spend some time in checking out different routes and modes of transportation to know your way around. Buy some local street maps. 9. Keep in touch with family and friends from your previous location: It is important to remember your family’s values and if you are unsure about any new activities, find out more information before you participate. Keep your expenses to a minimum by using free online services. 10. Do things that you enjoy on a regular basis: Do not forget to enjoy your new environment besides getting to classes in time. Try to keep up your regular habit of practice such as sports, or find a restaurant that has your favourites. Till today, there have been 14891 visitors (25005 hits) on this page!